NAKURU, Kenya, April 17 (Xinhua) -- While circulation of plastic bags for secondary packaging in Kenya is expected to cease in August, consumers are already looking forward to adoptable alternative befitting their daily activities. Plastic bags with or without handles used for commercial and household packaging will no longer be manufactured or imported into Kenya thereby eliminating their use going forward. Following a notice of ban two months ago from cabinet secretary for environment and natural resources, manufacturers and suppliers have until August to clear their stock. "We cannot fight the government but what we need is a cheap alternative suitable to us," said James Nyamwanda, who hawks bananas at a residential estate in Nakuru. Introducing eco-friendly bags selling at a high price would be killing micro businesses, he said. "I will be forced to increase the price of bananas to make a profit should I buy the new bags at a high cost and that will automatically chase customers away. The government needs to think about this issue carefully," the father of five told Xinhua in a recent interview. Veronica Wanjiku, a grocer in Nakuru town's central business district is hopeful the ban will bring sanity to the environment but is anxious of the kind of alternatives likely to be introduced into the market. "If you look around, there are so many plastic bags littered around and I believe the ban is a good step forward but remember I cannot put chopped vegetables in a paper bag unless they are dry," she said. "But we will accept whatever the government brings as an alternative. All I ask is that it considers small traders like us," said Wanjiku who uses transparent mini-bags to package the goods for her consumers. These mini-bags are some of those categorized under secondary packaging that the government will not tolerate their usage after August 28. Secondary packaging involves use of plastic bags to package a product in a different location from point of production, explained Geoffrey Wahungu, director general at National Environment Management Authority (NEMA). Whereas Nyamwanda and Wanjiku reflect apprehensions of millions of Kenyans, it is this population that Nema, an enforcement agency on environmental policies and laws, pegs on to effectively close down on plastic bags. "We are banking on public awareness and good will to succeed in eliminating the plastic bags," he said. Manufacture of all plastic bags are encouraged to invest in production of alternative bags, he said. "All stakeholders are required to take reasonable steps to ensure that by Aug. 28, the production, importation, sale and use of plastic bags in the country ceases," he said. Abolition of plastic bag, a daily form of packaging in almost every purchase from both retail and wholesale shops, would stimulate revival of the sisal industry whose production has been degenerating for many years, according to Nema's chief official. Its revitalization and sustainable exploitation would offer an alternative to the plastic bags thereby avoid health and environmental effects resulting from their use, he said. 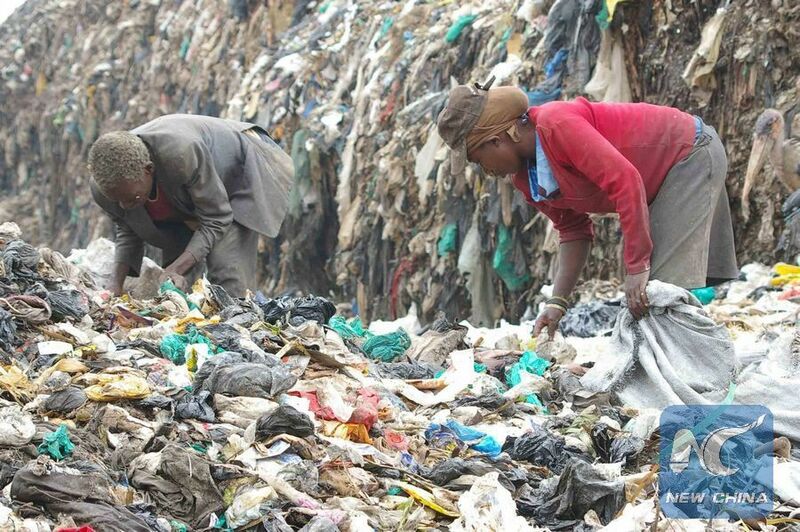 "Plastics create the biggest problem of managing dumpsites. They clog our rivers and oceans. It will take many more years to clean up our oceans. In areas where there is grass, plastics are littered all over and even the livestock find it so challenging to graze," he said. He said the agency is encouraging initiatives aimed at recycling plastics to clean up the ecosystem. "We are engaging with supermarkets to buy from groups recycling plastics in a way of creating a cycle of cleaning up the environment," said Nema's director general. The UN environment agency, UNEP, has warned of probability of having more plastic bags in the inland waters than fish by 2050 if proactive measures are not taken to stop environmental pollution with the solid waste. Plastic bags are not the only emerging solid waste causing detrimental impact to the health of the living things in and out of water. Electronic and electrical waste such as mobile phones are drawing global attention since they are also emerging hazards to the environment. In a latest report by World Health Organization, waste from these products if improperly recycled exposes children to toxins which can lead to lung damage, cancer, and reduced intelligence and attention deficits.